Selected iXon models are now available with a new EX2 Dual Anti-Reflection coating and Fringe Suppression technologies, applied to the back-illuminated sensors. EX2 affords a significant enhancement of the Quantum Efficiency performance in the blue and red/NIR regions, and Fringe Suppression reduces the effect of etaloning in the NIR. 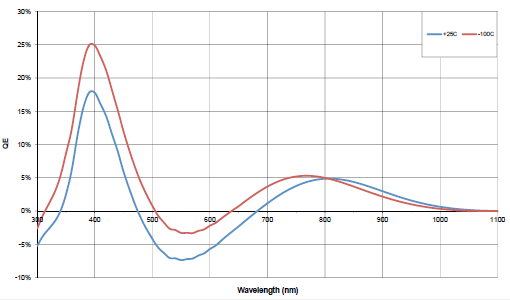 Figure 1: Back-illuminated EMCCD sensor QE curves, comparing standard ‘BV’ mid-band AR coating versus new EX2 dual AR coating. Reference data available at +20°C and -100°C sensor cooling temperatures. Available on the new speed-boosted iXon Ultra 897 and 888 cameras, EX2 technology facilitates broadening of the QE range of the back-illuminated sensors through implementation of a new dual layer anti-reflection coating process, developed by sensor manufacturer e2v (Chelmsford, England). The net effect is to offer significantly improved sensitivity in both the blue and NIR wavelength regions, whilst maintaining ~ 90% QE across the remainder of the visible region. QE varies somewhat as a function of sensor cooling temperature, so it can be useful to view reference QE curves at two extreme temperatures to achieve a sense of this dependence. Figure 1 shows QE curves for the new EX2 dual AR coated sensors versus that of the 'standard' BV single AR coating (mid-band optimised) at both +20°C and -100°C sensor cooling temperatures. It is clear, notably under more typical conditions of deep cooling, that the EX2 curve exhibits a marked widening of the QE response into both the blue and red/NIR wavelength ranges, while maintaining ~ 90% QE in the important region in between. Figure 2 shows the differential variation in QE for the EX2 sensor relative to the standard BV curve, presented again for +20°C and -100°C sensor cooling temperatures. It is evident that a relative QE boost of up to 130% is possible in the blue region at -100°C. Furthermore, when compared to a competitive multi-AR coated back-illuminated EMCCD sensor (available on the same sensor formats), data for each available for comparison in the approximate +20°C sensor temperature, the EX2 sensor exhibits higher QE in the wavelength range between 400-650 nm, i.e. exhibiting less QE drop off in this important visible region, and near identical NIR sensitivity. In terms of credibility, it should also be noted that the QE curves presented by Andor for EX2 and BV coatings are each measured by the sensor manufacturer e2v on the same apparatus, and thus are truly comparable. QE curves measured on different set-ups are subject to significant variation. Fringe Suppression Technology Fringing is generated in back illuminated sensors where the extreme flat surfaces of the substrate effectively create a Fabry-Perot etalon. The finesse (thickness) of the cavity is such that interference between reflected radiation within the sensor and/or the incoming radiation at the same wavelength can occur. The interference pattern level will be wavelength and cavity finesse dependant. This interference pattern can affect the acquired image or spectrum. Indeed, for NIR applications, such as imaging of Bose Einstein Condenates, etaloning effects, often observed more notably beyond ~ 750nm, can sometimes restrict the ability to perform high integrity quantitative imaging. Fringe Suppression refers to a mature technology offered by the sensor manufacturer e2v, and refers to a process whereby structured 'roughening' is introduced on the sensor back surface, which, when coupled with application of a given anti-reflection coating, leads to the reduction of the radiation reflections within the sensor, hence reducing significantly the fringing patterns. This does not affect other sensor characteristics such as dark noise, readout noise, readout speeds. The process has been validated over many years of CCD manufacturer and is now available on EMCCD sensors, specifically relating to the following iXon models: iXon Ultra 897, and iXon Ultra 888.